Skywatchers in Earth's northern regions may be treated to a dazzling aurora display tonight and tomorrow (June 9), thanks to a huge solar flare unleashed by the sun this week. The solar eruption triggered by the flare, known as a coronal mass ejection (CME), could lead to extra-luminous aurora displays for some lucky skywatchers. "The CME should deliver a glancing blow to Earth's magnetic field during the late hours of June 8th or June 9th," NASA officials said in a statement. "High-latitude skywatchers should be alert for auroras when the CME arrives." Observers in Europe and North America may be able to see a greenish-white arc or band of light near the horizon of the northern sky tomorrow night, according to the Space Environment Laboratory in Colorado. Tuesday's solar event was a Class M-2 flare, a medium-size sun storm. There are three types of solar flares; Class C events are the weakest, with Class M flares more powerful and the intense Class X flares topping the list. Coronal mass ejections are eruption of charged particles that sometimes accompany major flares. When aimed directly at Earth, the particles stream down the planet's magnetic field lines toward the poles. These geomagnetic events often ramp up normal aurora activity on Earth, making for unique visual displays in the sky. Extremely powerful solar storms can pose a hazard to satellites and spacecraft in orbit, as well as power grids and other infrastructure on Earth. 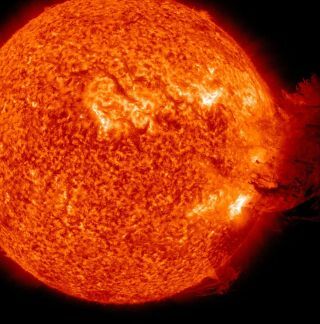 Tuesday's powerful solar eruption, however, was not aimed squarely at Earth. "The eruption took place well off-center, which means that the lion's share of the electrified particles shot into space will probably miss Earth," explained SPACE.com's skywatching columnist Joe Rao. "But nonetheless, this M-2 flare still appears potent enough, to send enough subatomic material our way to interact to some degree with our magnetic poles, though I think the main show will be for places at high latitudes." Several NASA spacecraft, including the Solar Dynamics Observatory, keep close watch on the sun for flares and CMEs, and serve as an early-warning system for major space weather events.